Zambezi National Park, one of the most beautiful parks you’ll find, is on the doorstep of Victoria Falls. In fact there are two distinctly different sections of this park. The most popular section has a lengthy (50km) river frontage with photogenic reed islands and bubbling rapids making it excellent for birding. Birds seen include Rock pratincole, African skimmer, African finfoot, Schalows turaco and I’ve even seen Slaty egret by Chundu 2 camping site. 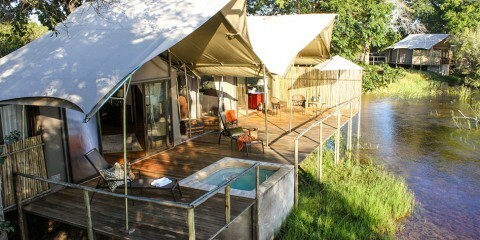 There are now five upmarket lodges within the park. Away from the river however, there’s a network of tracks that take you deep into the bush. Game is becoming much more abundant as the local anti-poaching unit grows from strength to strength and I’ve seldom driven around the park without seeing giraffe, hyena, kudu, impala, invariably elephant and buffalo too. A group of wildebeest have recently been reintroduced and are thriving. Hippo and crocs are always at the river and the lion population has been doing very well in recent years, as evidenced by very regular sightings. Wild dog are frequently seen giving rise to the local belief that several packs now hunt in the area. The other significant, though relatively undeveloped and seldom visited section of this park, south of the Kazungula road, generally known as Chamabonda, has been undergoing very welcome conservation activity and is home to large herds of sable and eland. It’s basically a long, open vlei (dried riverbed) and the best way of seeing game is to book a night staying at one of the two viewing platforms that overlook pumped pans. As well as the typical plains game associated with this terrain, you’re sure to see elephant, zebra and hyena with a very good possibility of lion and big herds of buffalo. This area is best suited to self-drivers with camping equipment. Some reports suggest ZNP is a Big Five park but unfortunately, it’s many years since rhino have been seen here. As well as the five upmarket accommodations within the river section of the park, National Parks accommodation has been upgraded and is very pleasant although situated near the entrance gate rather than deep in the park. The Zambezi National Park has two elements that combine the contrasting character of the Zambezi River. The Victoria Falls section is accessed from town, and the roar of the falls and the spray rising skywards, immediately lures all visitors to witness the river dramatically plunging into the gorge. I’ll never get tired of the uninterrupted views here, and staring directly at the thunderous wide curtain of raging water is an unforgettable experience. Upstream the game-park section has a wide variety of wildlife including The Big Five. You can explore on game drives, but I enjoy canoe safaris on this part of the river. Here I’ve seen elephant and buffalo splashing on the riverbanks, and hippo and crocodile at an alarmingly close paddle-distance away. It’s quite remarkable to know that just a few kilometres downstream, the quiet smooth-flowing river gains momentum and tips over the edge. Zambezi National Park is just a stone’s throw away from Victoria Falls and makes for a nice day outing if you have time to spare. The road in the park follows the Zambezi River and there are regular viewpoints from which you can see crocodiles, hippos and many waterbirds. 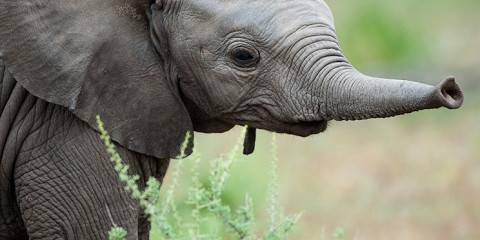 You’re likely to see buffalo, elephant and several antelope species. There is a pack of wild dogs in the park, but I didn’t see them. The park is a bit small to get very excited about it, but I love coming here very early in the morning when the mist rises from the river – the Zambezi at its most beautiful. Zimbabwe had changed a lot since my earlier visit in 2002. I was travelling on a press trip and although the tourism authority tried to show us the bright side I had been disappointed by the situation in Harare and how the great rich farming region of the south was now just smouldering bush where farm squatters hoped for a chance to shoot the last of the bushmeat that was all they had to live on. Zambezi National Park offered a chance to see that there was still hope for the country that I had long considered one of the most beautiful in the world. The famous sable eluded us (although I saw them elsewhere) but we saw hippos, buffalos, elephants and lions. I had been lead to believe that the animals were almost shot out – or at best unbearably shy. However we saw a park that was well stocked and where the animals still seemed to react normally to human interaction. 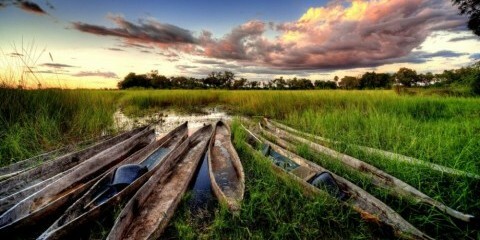 My personal feeling is that it is time for adventurous travellers to start drifting back to Zimbabwe. Without our support the country will not make the recovery it deserves. My only visit to this small but very scenic park adjoining the majestic Victoria Falls was pretty much an accident. I was due to conduct a quick site visit at the Victoria Falls Safari Lodge for a Fodor’s update on the Vic Falls chapter of one of their books, before returning to the town centre. As soon as I walked out onto the main deck of the lodge and looked out over the waterhole in front and the dense bush beyond, I couldn’t believe I was just a ten minute drive from the busy town and the tourist mecca of the falls. I had been told previously that most of the game in this park had been poached to the point of extinction, but my experience that day suggested otherwise. While eating breakfast looking down onto the waterhole, I saw elephants, buffalo, kudu and warthogs all drinking together while vultures circled overhead and a few marabou storks lurked around the fringes. Later in the afternoon I went on a game drive deeper into the bush, seeing a small pride of lions en route to the park’s picturesque riverine sections. Many visitors to the Vic Falls area head to Botswana’s Chobe for a quick safari fix, but Zambezi is a cheaper and quieter alternative. Technically, the Victoria Falls aren’t in the Zambezi National Park. They actually have one of their own, the Victoria Falls National Park. But the two parks are effectively adjoining, sprawled along the banks of the Zambezi, covering 56,000 ha (216 sq miles) and no one would visit one without visiting both. At the Falls, the only option is to walk, along the increasingly spray-sodden path round the canyon rim joining the many worshipping at the magnificence of the world’s greatest waterfall. Last time I was there, it was in full flood, a deafening roar with so much water spewing hundreds of meters into the air that nothing was visible but a giant white cloud. In front of Main Falls, dripping hippies in plastic raincapes and barefeet were performing rituals and raindances. Touching but very slightly strange… I could wax lyrical for many hours about Mosi oa Tunya, the smoke that thunders, with its dancing rainbows, but you have to see it for yourself. Further upstream, sunset over the Zambezi is another truly awe-inspiring natural spectacular, whether seen from one of the many ‘booze cruises’ or canoes that operate on the river, from the deck of one of the luxury lodges that fringe the National Park or from the back seat of an open Land Rover on a game drive. Sip your sundowner as the elephants cross back to shore from the islands linked nose to tail to break the current, the ilala palms silhouetted against a bloodred sun. This is Big Five country, and there is also excellent birding. Some roads become impassable during the rainy season and parts of the park close. Like many riverine parks it’s best seen in the dry, when the animals cluster along the river banks. Although this park can be a bit hit-and-miss, I would still unreservedly encourage tourists to visit. Most people access the park on day-trip game drives from the neighbouring town of Vic Falls and this is a good way to do it, as the park has limited infrastructure and accommodation. On good days here I’ve seen wild dogs hunting and lions padding down the road, along with large herds of elephant, buffalo and general game. But, on the flipside, I’ve also seen little more than impala and waterbuck on my quietest days in the park! It’s worth noting that this park tends to be at its best in the late dry season months of August to October when most of the animals are drawn to the life-giving waters of the Zambezi. The animals then disperse when the rains arrive in November and sightings tend to become fewer and further between. Extending westwards from Victoria Falls to the border with Botswana, this relatively small park is really just an extension of the nearby waterfall, and difficult to discuss outside that context. Almost all safari itineraries to Zimbabwe incorporate the mile-wide waterfall, which lies on the border with Zambia, and is justifiably included on a recent National Geographic list of the seven natural wonders of the modern world. And it is an utterly spectacular and an unmissable sight, one whose stature grows with every visit. 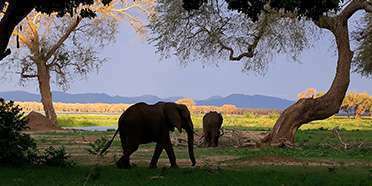 The national park itself hosts plenty of elephant and other wildlife, but it is arguably most enjoyable for the opportunity to canoe along a wild stretch of the Zambezi where hippos and crocs are joined by a host of interesting water and forest birds. Zambezi National Park adjoins the much greater attraction of Victoria Falls. I have enjoyed many nights in the inexpensive National Parks chalets, which are beautifully situated along the river upstream of the falls. However, wildlife in the park has been depleted by years of neglect and a game drive here will not produce much that you can’t see elsewhere along the river, such as elephant, hippo and bushbuck. Sable antelope still occur in decent numbers and lion are reputedly present, though rarely seen. Otherwise this is a place to enjoy the wildlife of the riverbank, from small mammals such as baboons and banded mongoose to numerous riverine birds, including African finfoot, rock pratincole and African skimmer. Those who enjoy wilderness with few facilities and other visitors, and are not too worried about spotting game, will still find the park an excellent retreat. A stroll along the riverbank from the falls to the national park is highly recommended, although dangerous game occurs and you should take local advice. Victoria Falls is, of course, an amazing sight and a major tourist attraction: today most activities centre on the Zambian side, where tourism has prospered just as it has declined in Zimbabwe. Located a few kilometres up the Zambezi River from the thunderous Victoria Falls, this small national park may be close to the action but, in my opinion, lacks the pizzazz of Zimbabwe’s other national parks. It hasn’t the abundance of wildlife as Hwange, it isn’t as wild or remote as Chizarira and it’s not as jaw-droppingly beautiful as Mana Pools. That said, there is still plenty of game to be spied with elephant, lion, buffalo and leopard as well as herds of sable antelope, eland, zebra, giraffe, kudu, waterbuck and impala all found here. While half-day and full-day canoeing trips are also available, if you’re a nature enthusiast or adrenaline junkie I’d recommend you opt for a longer canoeing safari at Mana Pools National Park or Lower Zambezi National Park on the Zambian side of the river. Zambezi National Park (not to be confused with Zambia’s Lower Zambezi National Park, several hundred kilometres away) lies in the Upper Zambezi, close to Victoria Falls in Zimbabwe, and is a boon to those who fly in with minimal time on their hands. It’s such a short hop from the hotels in and around the Falls that you can breeze in and out for an afternoon of hippo-watching and croc-spotting. If you book into the main safari lodge on the edge of the park, you can use its free shuttle service to travel between the park and Vic Falls town whenever you want, allowing you to visit the town, the Falls, the Zambezi and the bush, all in the same day. The downside for some is that, unusually for Zimbabwe, the lodge and its surroundings feel more like a mid-range hotel in a heavily-managed park than a wilderness camp. Nonetheless given that Victoria Falls is effectively a mass-tourism zone (albeit one that rarely gets busy, let alone crowded, these days), I think the park is better than one might expect: it’s possible to see the Big Five here, plus a good variety of antelopes including sables, elands, waterbucks and kudu.